Play the brand new TicTankToe on your smartphone! Tired of silly games? This game will challenge you! TicTankToe is the best TicTacToe game of all-time. This game supports one player and two player gameplay, so you can play against another human or against your device. You can also play the amazing military campaign divided into 20 levels! Every 5 levels you can unlock deadly new tank! Become the Master of the TicTankToe Universe and send your score online! Marmalade’s IwGxClear() / Iw2DSurfaceClear() functions seem to do something internally that prevents the display of Open GL rendering code. I believe that the actual underlying call to clear the screen is called when IwGxFlush() gets called so any Open GL rendering carried out during the frame is wiped out as soon as IwGxFlush() is hit. Ok, problem 1 is easy to fix. We’ve added a new property to CIwGame called GLCompatible. If you have any scenes in your app that need to render using raw Open GL then call GAME->setGLCompatible(true) to force IwGame to clear the display buffer using Open GL instead of IwGx. (You will need to download http://www.drmop.com/wp-content/uploads/2012/06/GameSceneGLTest.zip and use the new IwGame that is contained in the archive to use this new feature. Problem 2 is also easy to fix. In the scene that you call raw Open GL rendering code, call IwGxFlush() before you begin rendering using Open GL. This will force Marmalade to draw everything that’s waiting to be drawn. As IwGx is built upon Open GL you should also NOT rely on GL to be in the state that you left it in previous frame, so ensure that you restore matrices, shade model and any other GL specifics that IwGx may have modified. Have you ever played a game of darts and thought: is there no easy way to keep score of the game on a mobile device like a phone or tablet? Well, now there is! With unmatched easyness you can now track your scores on your phone or tablet and even post your game results on Facebook! With Dart Scorekeeper(tm) you can keep your scores while playing the ‘real-life’ game. The most easy scoring entry system ever! Just point your finger on the board and it will zoom in so you can place your darts. 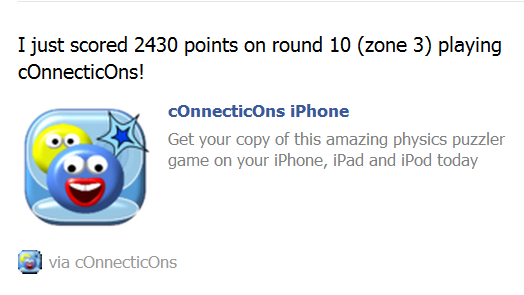 Post your game results on Facebook to share with others! Best of 3 or 5 legs per set. Best of 3, 5, 7, 9, 11 or 13 sets. Play from 20 – 10 or from 20 – 15. Also coming to iPhone and iPad soon. Ok, so we’ve heard back from a few of you and its apparent that XOML can be a little difficult to work with especially as it had no intellisense to help create well formed XOML. In the interests of making XOML much easier to write we have created an XML Schema that you can use to validate your XOML and provide intellisense support. Please note that the schema has only been tested in Visual Studio 2010. If you have problems with it in any other IDE then please let us know. To use the Schema in Visual Studio 2010, open your XOML file, right click somewhere on the page and select properties then go to the properties windows. Click in the Schemas box then click the small file selector to the right (this will open up all of the available XML schemas). If XOML.xsd is not already in the list then click the Add button which pops up the file select dialog. Select XOML.xsd and open it, this will place it in the XML schemas list. Now click in the Use column next to XOML.xsd and select “Use this schema” then click OK. Your document should now be validated against the XOML schema and you should have intellisense / auto-complete etc.. Please note that this will not take into account your own custom parameters, for that you will need to add your own complex types and attributes to handle it. Is IwGame difficult to use, if so can you suggest any improvements that we could make to make it easier to use? How are you finding the current feature set? Is anything particularly buggy, hard to use or simply missing something? What’s the next BIG feature for you, what would you really like to see come next? How are you finding using XOML? Do you prefer the declarative approach or do you prefer to code things up in C++ instead. Can you suggest any improvements you would like to see? If you have recently stopped using IwGame, what made you leave? Was there a better option and if so, what was the deal making features? This is the opportunity to have your say, any feedback that you can provide is greatly appreciated and will help steer the direction of the IwGame engine. Its been a tough week, my Apple Mac blew a gasket and refused to boot. Didn’t know this until I had spent 4 hours trying to make the Mac boot from Snow Leopard, but you cannot boot a Mac Mini from any version of the OS other than the original version that came with the Mac! Arrrgggghhhhh, insanity! In the end I turned my office and house upside down to find the original Mac disk. Ok, onto the update. IwGame v0.31 is kind of a special release because it contains the FULL source and assets of the game that you will see on Android Market and very soon Blackberry App World, Apple iTunes and SamsungApps for Bada. As well as the release of the full source for cOnnecticOns, we also snook a few extra col bits and bobs in there. The mark-up marked in red show the new AddVar and UpdateText XOML actions. AddVar – This adds -1 onto the EditorConnecticons variable and limits it to 0, so it does not go below 0. UpdateText – The next action copies the value of the EditorConnecticons variable into the ConnectButton text actor, which updates the number of connecticons on screen. It is now possible to attach actions in XOML to the menu and back button events in a scene by handling the OnKeyBack and OnKeyMenu events. Note that only the current scene will handle button events. Using the new EnterValue XOML tag you can bring up the device keyboard and allow the user to input some text into a XOML variable. As previously mentioned the full source to cOnnecticOns has been provided to enable developers to see a real working commercial game utilising IwGame. The first thing you will notice when looking at the code base is just how little code is actually there. This is because much of the mundane functionality such as creating layouts, handling events, creating animations, scenes etc.. are all handled by XOML. Please note that the supplied XOML is not optimised in way shape or form, in fact I have done many things long hand so as not to make the scripts convoluted and difficult to understand. When creating your own XOML you should probably focus more on re-use with templates, styles and global actions / animations etc.. Note that some files contain more than one scene. For example, each game level file contains the pause menu, the main game level scene as well as the in-game HUD. The pause menu and HUD exist as separate XOML files so they can be re-used across all levels. These custom actions and events allow us to tie our game logic much closer to our XOML code. Well that’s it for this update. We were aiming to get conditional XOML actions in for 0.31, but unfortunately it didn’t make it, but should do for 0.32.